Last summer we played these sport together with my husband colleagues. These sport is much fun and i find it interesting. When they say Golf it comes to our mind that it's one of expensive hobbies or sport in the whole world. 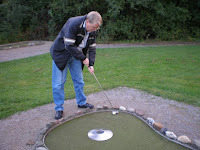 But not in mini golf, because these sport was so simple and you dont need to be member of the GOLF CLUB. Instead you pay only per hour. The minigolf courses typically use similar designs as the greens in normal golf place. JUST FOR FUN GUYS...but those was my first playing mini golf!!!!! nice, very rich ka talaga hahaha..